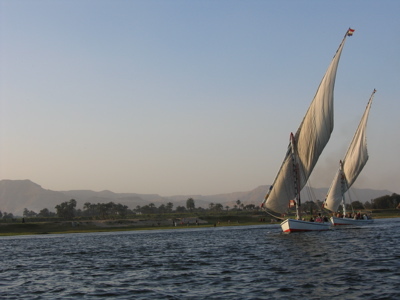 A nice photo off of the felucca (sailboat) Laura and I sailed on in Luxor. We went to “Banana Island” (not an island; but a tourist myth), paid off the “mayor” so we could tour the banana fields, had some bananas as our captain smoked sheesha, and then sailed back to the “port” (a docking area in front of a huge construction site). Once docked, we met all the children apprentices, a shifty guy named Hassan “Joker,” smoked real Egyptian sheesha (raw honey tobacco that gave us a buzz), ate kushary, looked at photos from trips past, and left the boat without the captain even asking us to tip him! Great experience. 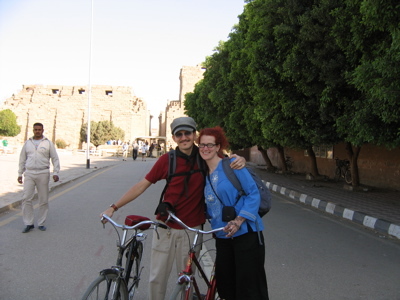 Laura and I rented bikes for two days while in Luxor. Great way to get around, get off the tourists roads, and avoid most of the touting. 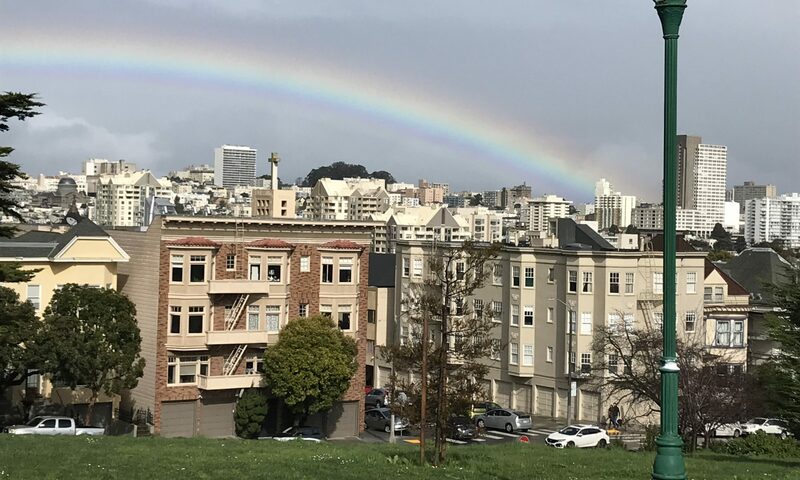 The nice Asian man who took this photo joked that he wanted backsheesh for it. We looked at him puzzled and he laughed, replying “No backsheesh! My pleasure!” This was shot outside of the huge Karnak Temple complex north of Luxor. 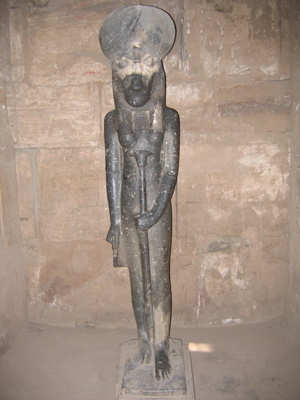 Our guide book stated that we’d have to pay a bribe to see this amazing statue of Bast, the Egyptian goddess of war. I’m glad we dropped a bit of cash to the man who let us in the dark room, past the huge wooden door, to see this great ancient sculpture. 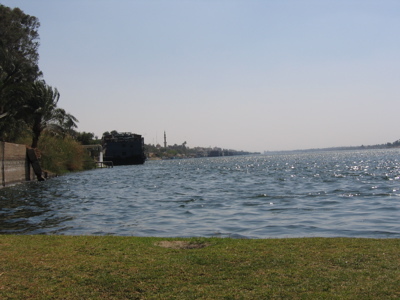 From maybe the only piece of grass, and public access, along the Nile in Luxor (in the background here), Laura and I got to have a moment of peace before the locals started begging for backsheesh. One of them, washing his horse Rambo, shared a smoke with us, practiced English with us, invited us to a wedding (we where leaving so missed it), and didn’t ask for backsheesh. Laura gave him some because he didn’t ask. Will blog about meeting this nice young Egyptian soon!